Recently I photocopied a small map of the Cle Elum Ranger District section of the Alpine Lakes Wilderness and drew the shapes of large fires from the last twenty years on it using a chunky red colored pencil. There were four red splotches: Lemah-Escondido (1000 acres, 1994); Polallie Ridge (900 acres, 2006); Lemah (800 acres, 2009); and Trail Creek (200 acres, 2012). Interesting to look at the big picture in this way as fire has been allowed to return to the wilderness as a natural process. It’s like puzzle pieces falling into place. I feel fortunate to have been in the field observing each of these fires as they came to life, grew, decreased and finally went out. Each one was unique, occurring at their own point in space and time. The aftermath is what I find endlessly fascinating. Trail work has taken me back to these places so my colleagues and I get to witness what happens to an ecosystem after a disturbance. The Lemah fire in 2009 started in late July and crept around on the forest floor for a month. We confined it to one side of the Pacific Crest Trail and kept an eye on it. The weather shifted significantly in late August as the fire moved to a more southerly aspect and climbed up into the old growth hemlocks. One afternoon it consumed four hundred acres in a swirling billow of smoke and roaring flames. For a few days there was excitement and general amazement. Then the fall rains came to subdue it. The fire festered and smoked until winter snows buried it. It is a peaceful place again, the deep forest now opened to sunlight. Bark sloughs off the dead trees in curled sheaths, and naked saplings bend over the trail. Fireweed (Epilobium angustifolium) is a pioneer plant. Its fluffy seeds land on the charred soil and take root, pushing up tall spires that sway over hikers’ heads. The flowers open in late July and early August, a prodigious flush of hot pink. The afternoon sun casts long shadows through the spikes of snags and flowers. It is a hummingbird haven. Small birds rocket through the air with zinging wings and squeaky chirps. Plenty of nectar for all! Rufous and calliope hummingbirds share this space, defending their tiny territories to raise their young. They apparently fear nothing, and zip up to a human, hovering until they figure out what this lumbering creature is. Not food, not a threat. Then they zip off again. Fireweed colored the industrial-scale clearcuts of my childhood landscape. Watching the pink appear reminded me that the freewheeling days of summer were numbered. Before long, Mom would be bundling us in the car for the trip to town for new school shoes and tablets and pencils. 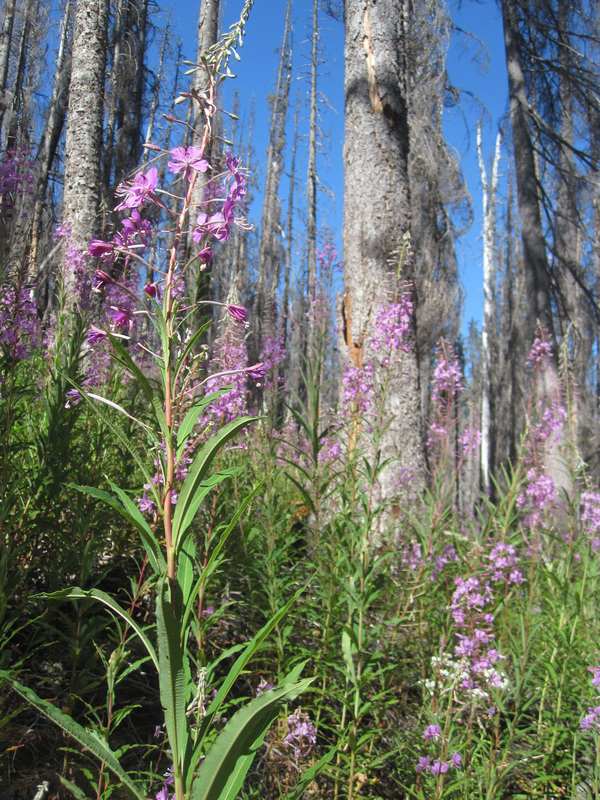 Fireweed is a bittersweet flower–still summer, but a reminder of impending change. After a long commute through the burn, we arrive at the work site. All day we labor next to the roar of a waterfall. It’s Delate Creek, spilling over the lip of rock that holds Spectacle Lake. It thunders down, and we holler at each other to be heard. When drinking water containers are drained, we walk across the bridge to a side stream to filter more. 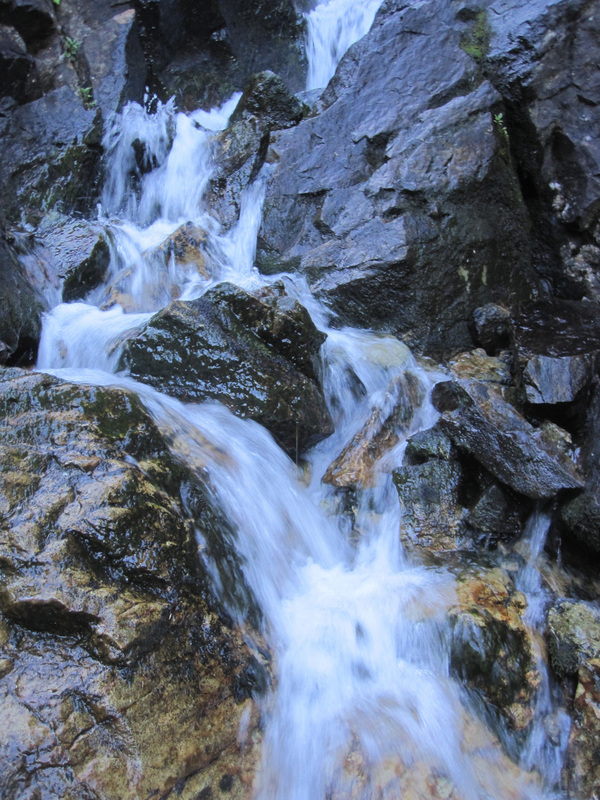 The water-filled air is like cool breath, blessed relief on this hot day. I think to myself: this is one reason why these mountains are called the Cascades. A project log is one you walk up to and know you are going to be at that spot for awhile. It will take hours to clear from the trail. Some of the more infamous ones have names. “Remember the one that fell on the puncheon at Deep Lake?” someone will ask. Oh yeah. We remember. I’ve written about The Ogre. This week we dealt with Slabby. Slabby fell during the winter of 2010-2011, same as The Ogre. We are only now getting around to cleaning it off the PCT. Slabby was a big western hemlock hollowed out by rot. Only the outer four inches or so was sound wood. The structure of the tree could no longer stand the strain of standing vertically, so it twisted off the stump and fell to the ground, shattering into long pieces. These shards completely blocked the trail, forcing hikers of go up and around, picking their way through the wreckage. Last year Pam and Sam and I came through to log out, but didn’t have time to cut through Slabby. Now it was time to get the job done. I had tried single bucking some of the chunks, but the saw bound and pinched in the cuts after I got partway through. I would have to chop. While waiting for Jon to bring up the double bit axe, I chopped with the smaller single bit. “I hate hemlock,” I pronounced after the first swing. Then realized that’s not really true. I do not hate hemlock. As a tree, it is a fine one. Western hemlock grows in warm moist environments at lower elevations. It thrives in the shade of other trees and can grow to great size. The wood is tight-grained and sound when it has not been compromised by fungal rot. 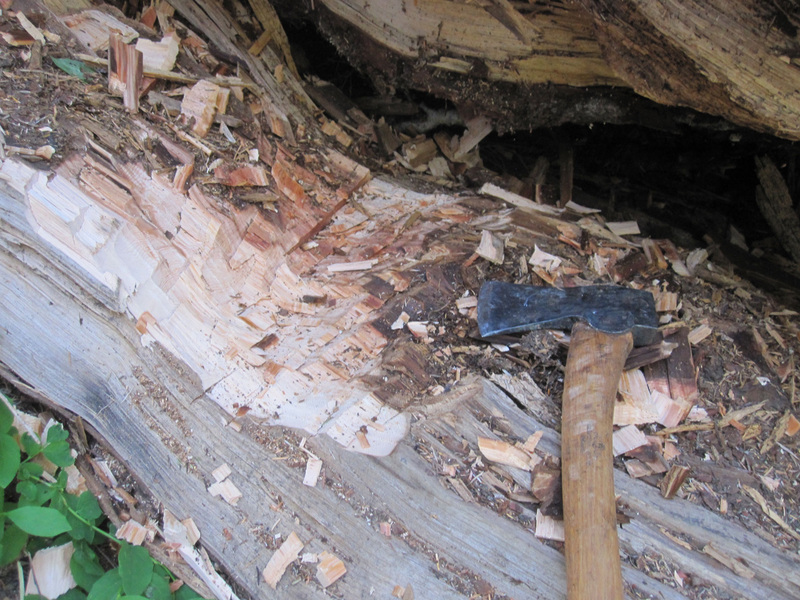 What I dislike is chopping and sawing through hemlock when it crosses the trail. I don’t hate it, but recognize that I am in for a prolonged exercise and patience is required. Long ago the trail crew renamed it “hemrock” for its hardness. I have heard my brother, a logger, refer to it is “scumlock”. Hemlock is hard wood. It will not break. You have to chop or saw through every last inch. Hemlock cuts you no slack. You’re in for it, so go ahead and complain as you swing and hit again and again. When you finally sever the chunk, you have earned that short burst of satisfaction that comes before turning to the next slab that needs to be removed. There was a sense of gratification, pride even, when we finally got Slabby off the trail, including the the long stringy pieces of rotten wood. It was spooky. 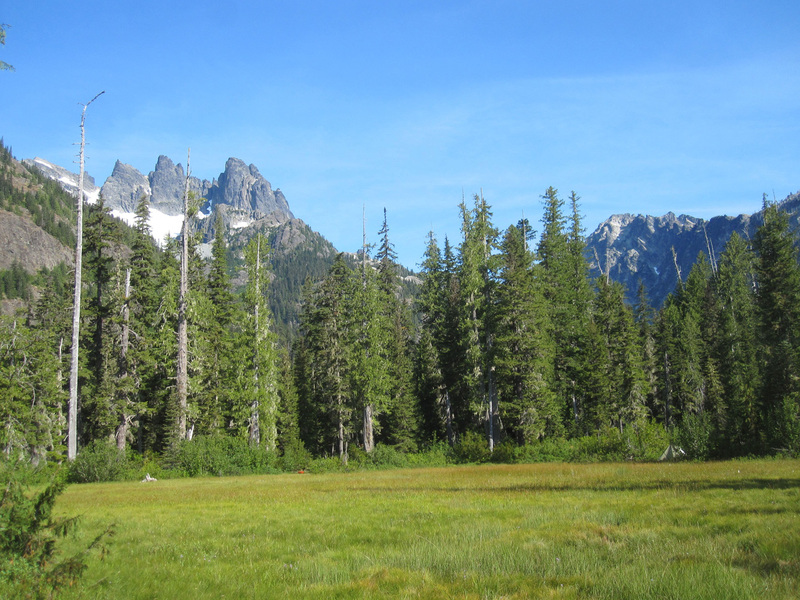 A trip to Lemah Meadow without being rained on or being eaten alive by bugs? I mentioned this to Jon, and he agreed that it was probably a first in trail crew history. Sure, the meadow was wet with dew in the mornings, and there were moments with the mosquitoes and flies. But we easily recalled other trips filled with far more misfortune than this one. The time we never took off our headnets except to shovel in dinner. The time mice got into the foodboxes. The time mice launched themselves at Jon’s tent and slithered down the nylon walls with their little claws scraping all the way down. The numerous wet pack-outs. I made time to walk around the meadow, noticing the encroaching trees. The interesting bog plants. The fire-scarred cedar snags down at one end. The magnificent view of Chimney Rock and Summit Chief. That glacier up there is melting just as sure as the meadow is filling in with trees. Hiking out, I noticed that much of the some of the vegetation around Pete Lake appeared much more parched than it had three days earlier when we walked in. Thimbleberries love damp lowlands, yet here they are giving up where the sun has been beating on them strongly. 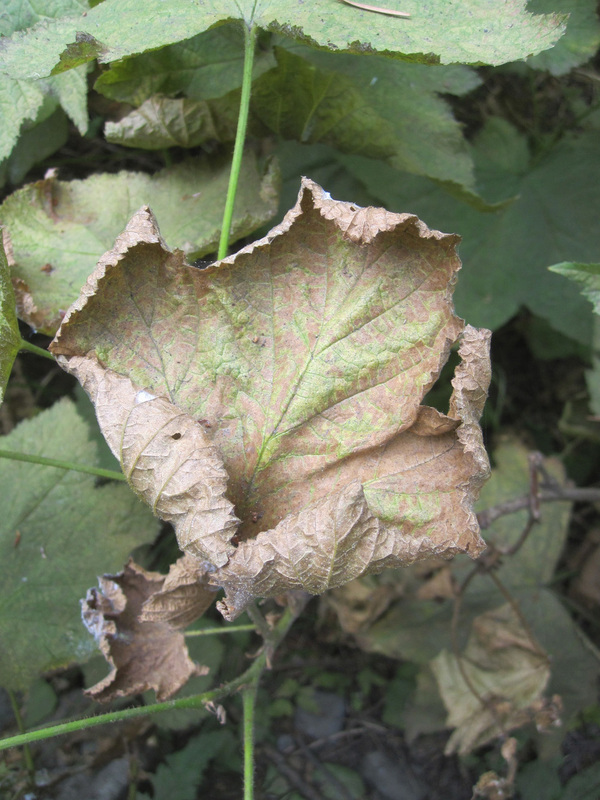 The soft green leaves turn brown and papery, curling at the edges. The trail is pounded to dust by hundreds of feet. The woods are dry, even on the Cascade crest. This area has been traditionally thought of as wet and green. The asbestos forest, unable to burn. Yet I know from my map of wilderness fires that it does burn when conditions are right. When I get to the truck, my uniform shirt is completely soaked with sweat. I’ve been drinking water all day, yet there is an unrelenting drought in my throat. Now I have been home for over twenty-four hours, rehydrating and doing laundry. In the afternoons cumulus clouds pile up over the mountains and the sky flashes and rumbles after dark. Rain pelts down out of thunderheads, watering my garden. Tomorrow I go look for fires.